Dower chest carved 1920 for Atkinson . Who was Nellie Payne? The Atkinson family were good friends with the Payne family in Hobart. Mr Thomas Reibey Atkinson (1844-1902) had married Edith Ella Toffl (1865-1955) in 1888. Mr Atkinson was a Legislative Council member from 1897-1902. They had 4 children – Thomas, Alan, Russell, and Alison. 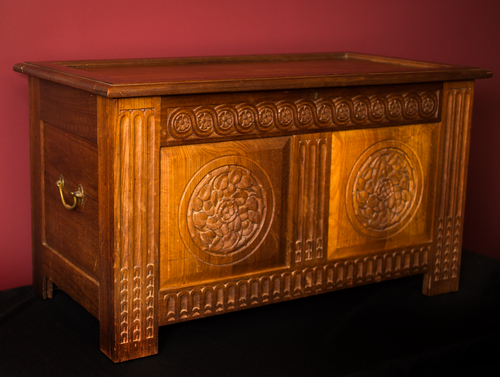 This chest may have been carved for Alison Atkinson for her 21st birthday. Unfortunately Alison died young of TB. Russell Atkinson was the author of “Ellen Nora Payne – Woodcarver of Tasmania”. His daughter Rosemary Bowman still lives in a retirement village in Victoria and has been most helpful to our committee with information on her father and his connection to the Paynes and why he wrote the book. We thank Rosemary, as well as Alan Atkinson’s son David and daughter Helen for their invaluable assistance and for allowing this chest to be displayed at our exhibition.